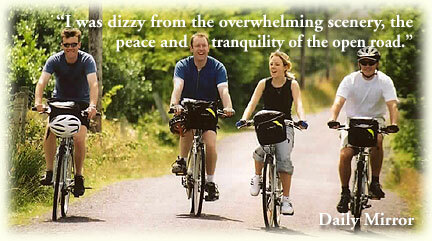 Cycling holidays in Ireland are a welcome breath of fresh air. A short flight leads you to a warm Emerald Isle welcome. And while you're in a different country, you'll find you're quite familiar with many of the locals. 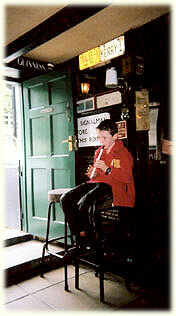 From U2 and Westlife to lively folk music; Irish whiskey to Irish stew, look forward to enjoying all the originals. But there's so much more to Irish holidays than raucous nights out and the good old craic. From Donegal in the north to Cork in the south, Dublin in the East and Galway in the west, this ancient island is full of natural beauty. Like the soaring cliffs of the rugged west coast and the quaint villages and rolling hills of Ireland's interior. Holidays to Ireland are full of surprises too. We run a choice of guided cycling tours catering to your timescale and fitness level, in the most beautiful parts of the country. Our guided cyle tours cover almost every part of Ireland: Clare and the Burren, Connemara and Mayo, Ring of Kerry and Dingle, Wild West of Mayo, West Coast and Kerry, West Cork Coastline, Glens of Antrim and Highlands of Donegal. We take care of all accommodation, bicycles and maintenance, we provide a cycle guide, as well as all the equipment you need - and best of all, we carry your luggage for you - taking away all of the hassles, but none of the adventure. All you have to do is enjoy a special vacation of calm, exhilaration and fun. 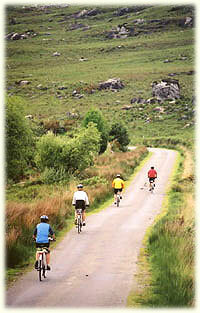 On our group cycling holidays we bring together groups of people from all over the world. Our daily cycle is a leisurely 30 - 40 miles which we find gives plenty of time to stop and explore your surroundings. Longer options are available for those who want to stretch their legs. 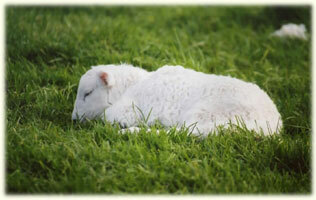 The best way to enjoy Ireland is to absorb the Irish pace of life. Each day, after a hearty breakfast, we start the day's cycle at approximately 10.00am. A few hours' leisurely cycling in the morning brings you to our lunch stop, where you can put up your feet and swap stories. After digesting the last of the lunch, we continue on our road. The guide brings your luggage ahead to your room while you take your time and amble through the beautiful back roads. Each evening after a relaxing shower you meet up with the guide and rest of the group for dinner. 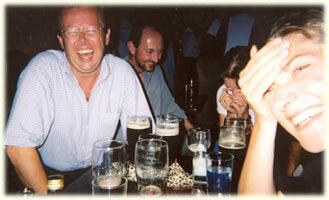 A day typically winds up in one of the many pubs whose atmosphere has made Ireland famous for music and "craic". Our guide should always be on hand in case anyone wants a lift. We make sure that your bike is ready to go, and that your luggage is transferred ahead each day. You explore the country at your own pace, and there is all the time in the world to stop or to make your own detour. We stay in comfortable hotels and guesthouses, and arrange the best place for lunch and dinner each day. Our recommended routes are about 30 miles a day and there are always longer options for keen cyclists. Although the guide will not be cycling with you, he or she will be driving the support van and will make a sweep to ensure that all is well, and offer lifts to those who want a break. If at any point you need to contact the guide, you will have the telephone numbers of the guesthouses where you will be able to leave a message. This provides a sense of freedom in that you can travel at your own pace in the security that the guide is there for you in the event that you might need them. The guide will recommend places to eat and try to find out where the best entertainment is each night. While Irish weather is not easy to predict, our mild climate is ideal for cycling and the occasional shower can even add to the atmosphere of the landscape. The temperature will almost always be moderate, typically between 15-25 C (60º-80º F). We recommend that you do bring some rain gear; however, equally we recommend you bring suntan lotion and a sun hat! Other than young children, whom we discourage from attending, people of all ages and abilities come on the tours, so do not worry if you are not super-fit. You have all day to cover the recommended route, and while Irish roads rarely follow a straight line, there are few really high climbs. Sore bottoms are an occupational hazard on a cycling tour, but a pair of padded cycle shorts or a gel saddle cover can work wonders. Complete beginners might also take a few practice rides before coming on the tour. We will be using Trek 721 hybrids on our tours this summer, as well as the latest Dawes Kalahari Trekking Bicycle on some trips. They come equipped with 21 speed grip-shift gears, carrier, mudguards, water bottle and a front pannier bag. People looking to use toe clips can bring their own, which we can then attach to the pedals. We give out maps along with route directions and historical details at the start of the week. What kind of food and accommodation should I expect? We stay in a combination of small family run hotels and guesthouses. The standard of such accommodation in Ireland is very high, with the vast majority having en-suite bathroom and other excellent facilities. We try to pick places with character; your home for the week can vary from a Victorian townhouse, a remote lakeside hotel, a farmhouse by the sea, an attractive harbour guesthouse, or an old style family hotel in the middle of a bustling market town. Breakfasts are included each morning, which in many cases will keep you going for the day! Our rooms are allocated on a twin-sharing basis. Unfortunately, we are very limited in our ability to provide any single rooms. As we transfer the luggage each day, you are free to bring a ballgown and tuxedo should you wish to. However, we find that more experienced travelers arrive with one compact piece of luggage, and look on with amusement at those who have to drag their kitchen sink along airport corridors. Do bring a comfortable outfit for the cycling, and a pair of padded cycling shorts if you have them. We keep a limited stock of cycling helmets in our van, but you are advised to bring your own, which should be more comfortable. We are happy to advise you on any travel arrangements into and around Ireland, and about additional accommodation or other services. Each of our safaris starts close to bus and railway stations, so they are all accessible by public transport. We can provide rail vouchers, which give you a discount on journeys from Dublin to Cork or Kerry. While we encourage you to give your car a holiday for the tour, we can arrange parking for those who have to arrive on four wheels. On booking, we can send you more specific information on the travel arrangements to and from each starting point. Each cycling trip starts on a Saturday evening at 6.30pm, and finishes the following Saturday morning. Although most the tours finish where you start, some are a little different: check with each tour. Our office can usually make separate arrangements for those arriving late or having to leave early. We supply 21 speed hybrid touring bikes for the tours. Repair equipment, helmets and pannier bags are available for each client. "This holiday represented the most efficient level of organization I have met so far - and I have a fair few under my belt! It ran like clockwork and was at the same time extremely personalized and friendly"
"Lovely Fuschia and Montbretia everywhere, not to mention the blackberries, always available for picking when you"re flagging." "Suffice to say we would heartily recommend your operation to a friend." "I returned home from the trip with my spirit refreshed, a smile that wouldn't fade and memories to last a lifetime. Thanks ICS for an outstanding holiday." "The group gelled famously and like pilgrims we meandered through the wonderful countryside." "Many thanks for a refreshingly well organized holiday! The weeks cycle tour was exactly what the brochure promised... Anyone who knows Ireland would agree that the vital ingredients that make a successful holiday are good company, a sense of humor and a set of waterproof clothing. You provided the rest and the holiday was complete!" "We encountered a lot of friendship that usually takes a lot more time to develop. It is the common goal for all the participants and the approach by your company that do the trick." "How fabulous our Wicklow tour was. The people were great, Adrian was a doll, we had what probably was our best vacation ever." "Congratulations to your company. It was my first organized tour and I couldn"t have asked for better. You"ve obviously put a lot of work into your tours and it shows." "It was a great week - not enough time to see all the highlights of Clare- will have to return - many times!" "Perfect for the first timer! Routes were well chosen to avoid traffic, included fabulous scenery and were challenging without being impossible"